Fireball habanero peppers should come with a warning sign tied around their stems for the uninitiated, and that applies to this Habanero Hot Sauce as well. So consider yourself warned! This is a massively fiery hot sauce and all you need is a drop or two to amp up your favorite dishes, with a special nod to Fish Tacos and lighter grilled meats. Peach seems to pair effortlessly with habaneros and that’s the key to this version. The result is a sweet, flavorful burst of searing heat that will wait patiently in the fridge for the inevitable house guest in search of something hotter. If you’re new to habaneros you’ll frequently find them next to the jalapenos in the produce section. They turn orange when they ripen and that’s typically how they are sold. As is usually the case, the smaller the pepper the hotter it is, and habaneros are no exception. They are legitimate fireballs and normally you don’t need to use more than a slice of them to take advantage of their heat. Unless, of course, you’re making hot sauce so we’ll use six of them. 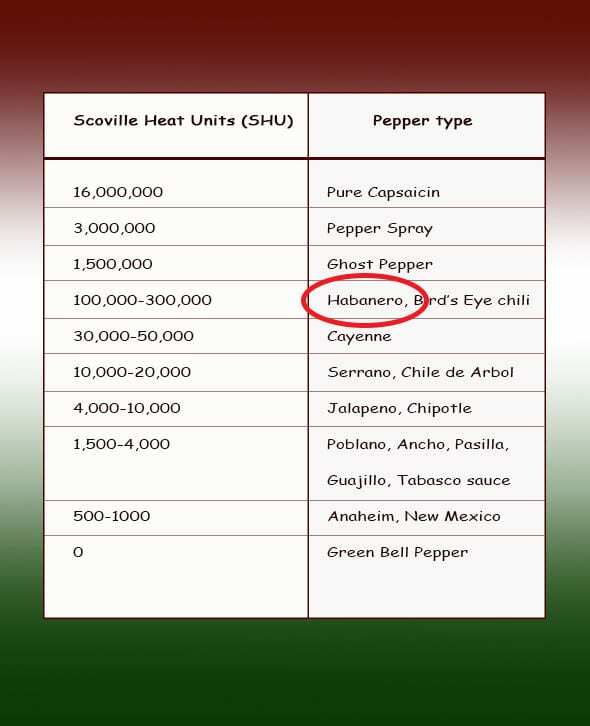 Take a quick look at this Scoville table that ranks chili peppers from hottest to mildest. 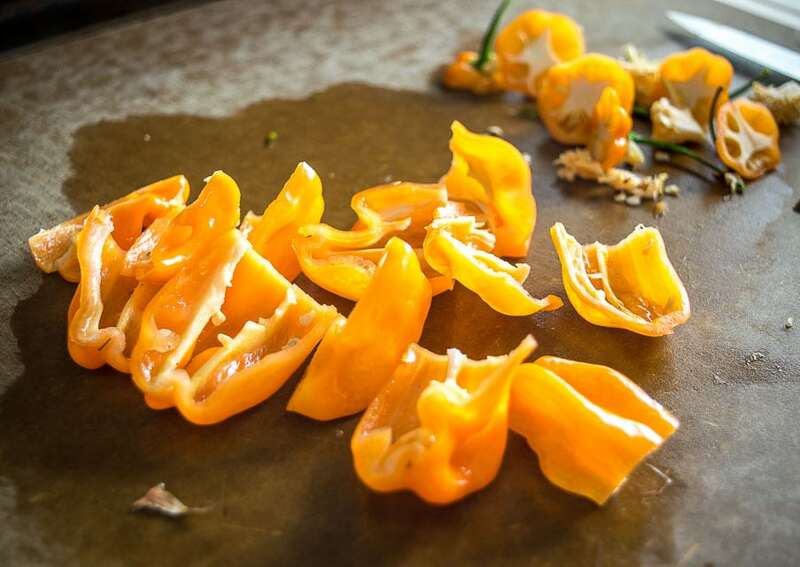 Yes, you read that right, habaneros are typically 20-30 times hotter than jalapenos. That’s no joke so keep in mind that it’s best to use caution when handling them. If you have any scrapes on your hands or have sensitive skin then it’s best to wear gloves when handling them. If you mistakenly touch your eyes or nose after working with them you’ll get some unpleasant burning. Scraping out the seeds and veins is a good way to tame their heat but it isn’t necessary for something like hot sauce so you can consider this optional. Roughly chop a small onion and saute it in a dollop of oil along with 2 peeled garlic cloves. I usually leave the garlic cloves whole because all of this is going in the blender eventually. 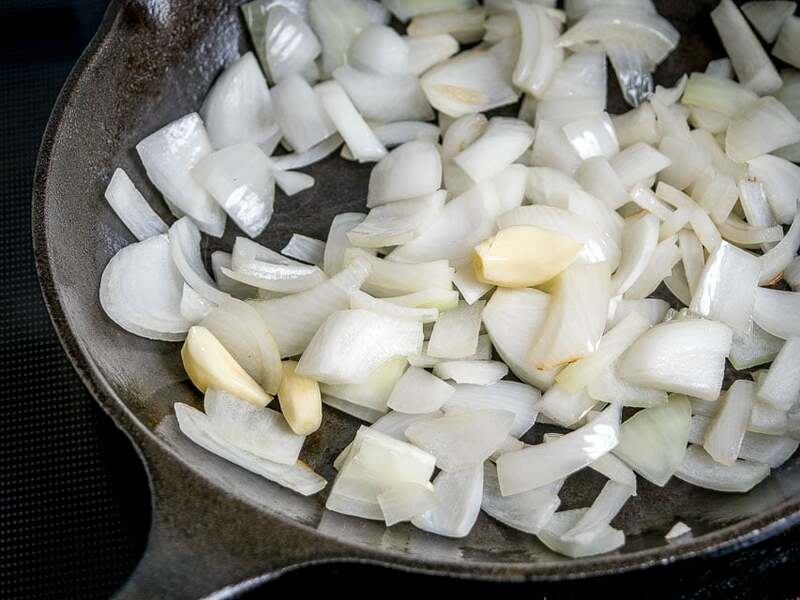 If, like me, you reach for your cast iron pan out of habit to saute onion and garlic, then consider switching to a non-reactive pan like stainless steel for this recipe. I mistakenly used cast iron for this batch and even though it’s a quick simmer once the vinegar is added the acidity did eat away some of the seasoning layer of the pan and that is no bueno. A single cup of fruit seems to be a good ratio for this recipe, with peach, pineapple, and mango all being good options. 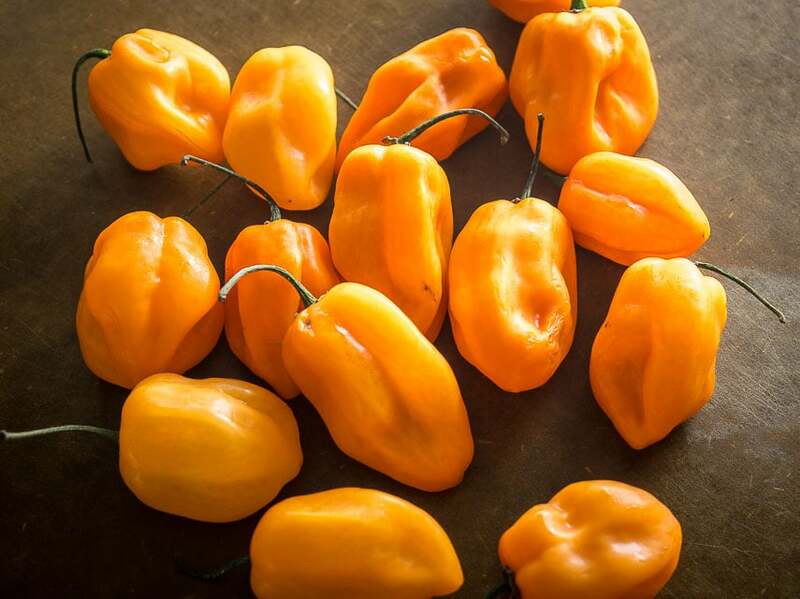 Habaneros are naturally fruity and will pair well with any of them. I used canned peaches and fresh pineapple for this batch but definitely try to use fresh fruit whenever you can. Let this simmer for 5-10 minutes or until everything is at a uniform temp. 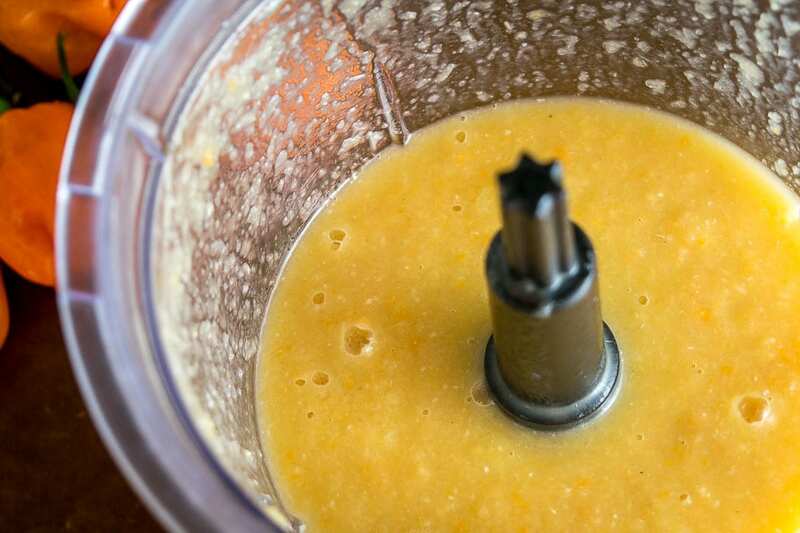 Add it to a blender or food processor and give it a whirl. But before you try it remember that you’ve been warned! Just take a small taste at first. If all went according to plan you’ve got a sweet, fiery, tangy hot sauce on your hands. Nice! I think there is plenty of sweetness from the fruits but you are welcome to sweeten it further with agave or honey. Adding sweetness can also temper some of the heat if you think your batch is too volcanic. 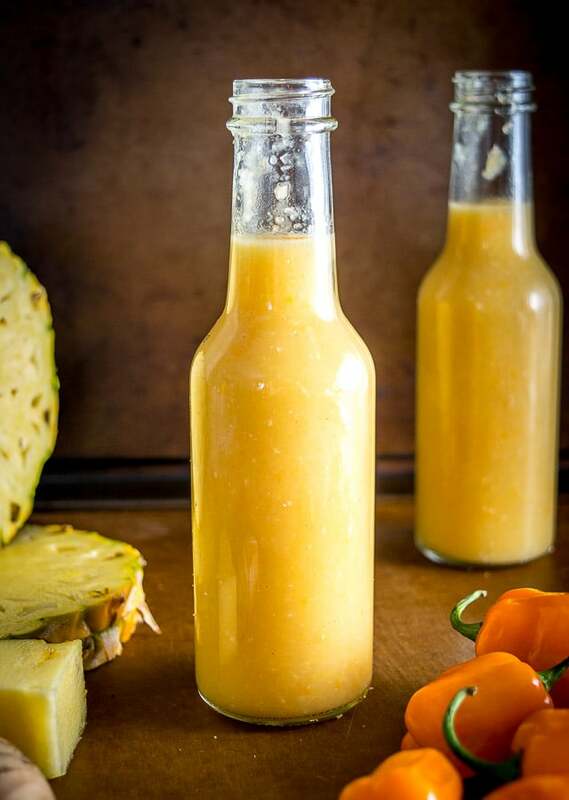 This recipe will make 2 cups worth of Habanero Hot Sauce. That’s enough for three 5 oz. bottles (hot sauce sized). Save your old hot sauce bottles because you can always use them to make your own. Or you can buy hot sauce bottles on Amazon for about a buck each. And keep in mind that you can strain this hot sauce if you want a thinner, more liquidy version. I usually skip the straining and leave it slightly chunky. Either way, this will keep in the fridge for at least a month and now you’ve got the perfect answer for when someone asks for something hotter. There’s something remarkably satisfying about making your own hot sauce and a homemade version has a life-affirming zip that you might get hooked on. And don’t forget that there are no set rules when making hot sauce, so feel free to get creative and adjust this version to suit your palate. 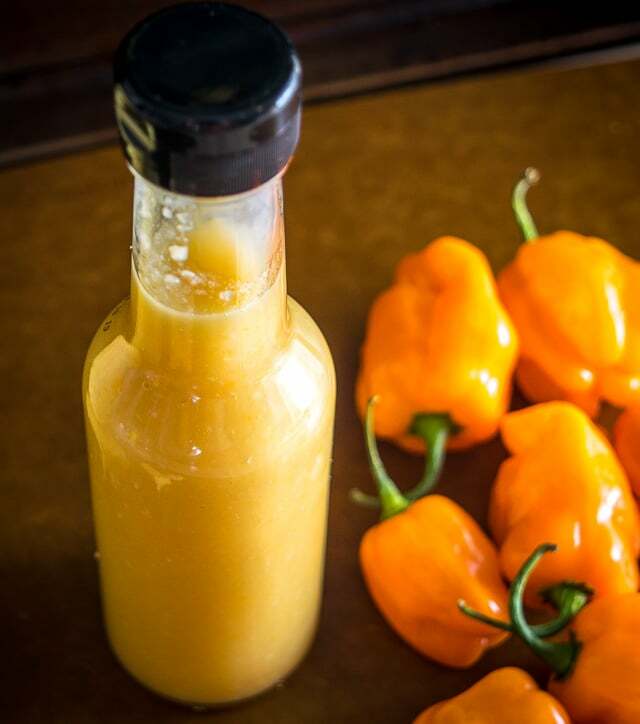 Just don’t forget to warn your friends and family when you plop a bottle of this fiery Habanero Hot Sauce down on the table. They will appreciate the warning, and then ask you for the recipe. Consider yourself warned! This is a massively fiery Habanero Hot Sauce! All you need is a drop or two to amp up your favorite dish, with a special nod to Fish Tacos. Yum! Give the habaneros a good rinse and de-stem them. Out of habit, I usually scrape out the seeds and pith of habaneros but you can consider this optional. Use caution (or gloves) when handling habanero peppers. Saute a roughly chopped onion and 2 whole, peeled garlic cloves in a dollop of oil. It's best to use a non-reactive pan for this recipe with stainless steel being a good option. 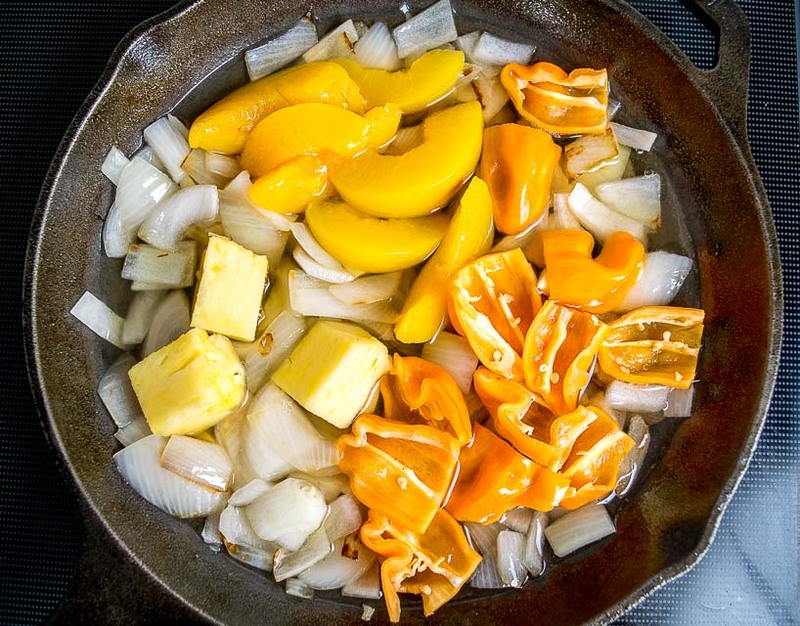 Once the onion has softened (5-8 minutes) add the six habanero peppers, 3/4 cup peach, 1/4 cup pineapple, 1" piece of peeled ginger, 3/4 cup white vinegar, 1/2 cup water, 1/2 teaspoon salt. Let the mixture simmer for 5-10 minutes or until everything is at a uniform temp. Add mixture to a blender or food processor and combine well. Take a taste. It will be plenty hot so consider yourself warned! You can add dashes of agave or honey to sweeten it up and temper the heat if you want. Serve immediately or store in hot sauce bottles in the fridge where it will keep for at least a month. Use caution (or gloves) if it's your first time using habanero peppers. Be sure not to touch your eyes or nose when handling them. Wash hands (and knife) thoroughly after handling them. A single cup of fruit seems to be a good ratio for this recipe, with peach, pineapple, and mango all being good options. I used 3/4 cup peach and 1/4 cup pineapple but feel free to get creative. Considering the acidity of the vinegar, it's best to use a non-reactive pan for this recipe, with stainless steel being a good option. You can optionally strain the hot sauce if you want a thinner, more liquidy version. I usually skip the straining and leave it a bit chunky. This sounds great and I have a bunch of habaneros that I need to use. I just wish it lasted longer than a month since a little bit goes a long way. Hi Bruce, given the amount of vinegar in this recipe there is a good chance it will last longer than a month but I always default to the cautious side when it comes to food storage. Cheers. This sounds amazing! I love that it has pineapple and peaches in it. Yum! Do you know if this will last longer than a month at room temperature if I sterilize the containers before and after bottling? Thinking of using sodium benzoate too. Hi Keith, tough question! To be honest I don’t do any long term canning or preserving so I can’t really answer from experience. The recipe has loads of vinegar which does prevent the growth of bacteria, but I can’t say for sure how long the safe period is at room temperature. Sorry! I make similar sauces and as long as you sterilize the bottles (boil them for 10+minutes) and everything else you will be using (bottle caps, funnels, etc) and then also pasteurize the sauce (boil for 15 minutes between 180 and 195 deg F) it should easily last a few months refrigerated with that amount of vinegar and salt. I can’t say how long it will last at room temp after opening though. I rescued a habanero plant from the discount area of our nursery and it blessed me with a crop of peppers! 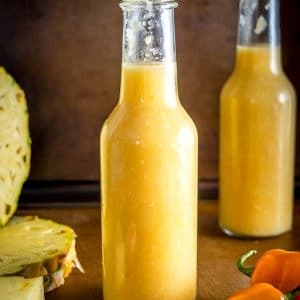 I had to quadruple the recipe and make adjustments for the sizes of my peppers with added sweetener and a couple of more peaches and this stuff is amazing! I forgot to add the vinegar at first, so it was thick enough to eat with chips, and after I added the vinegar it is thin enough to put in my pepper jars. This will be awesome added to recipes and black beans and topping for fish! I am gifting the jars to my hot sauce loving friends and family this Christmas! Ha awesome Linda would love to have some homegrown habaneros! Yeah the vinegar will thin it out but will also help it keep longer in the fridge. Cheers. what would you put this type of sweet chili on? Can imagine what kind of mexican food i would add this to…. Hi Lydia! This hot sauce will work best with seafood or lighter grilled meats, with a special nod to fish tacos. Cheers.